Posted by stuffilikenet in Awesome, Mutants, Science. The bacteria Candidatus Desulforudis audaxviator has been discovered two miles beneath the surface of the Earth in a gold mine in SouthAfrica. It’s warm down there; a balmy 60 °C and completely devoid of light and oxygen. Being too far from light and oxygen has only made the little fellow more hardy; he seems to subsist on radioactive decay of uranium (sound familiar?) instead of grubbing for photosynthesis…or even eating other bacteria. 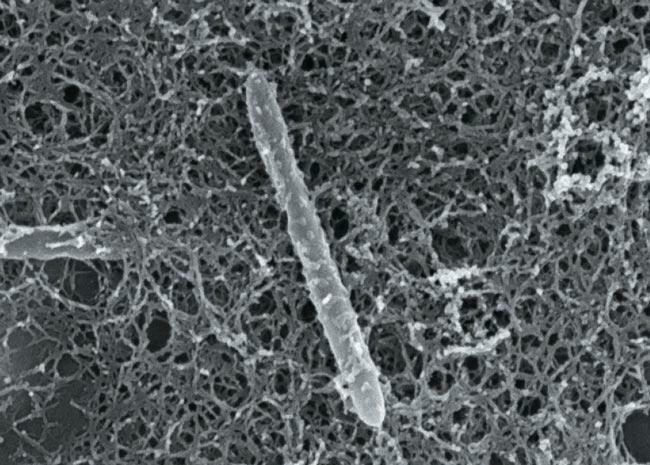 Yes, in the water-filled cracks in which D. audaxviator lives, there are no other bacteria. That’s right; no food at all. Sure, it has genes to extract carbon from dissolved carbon dioxide and other genes to fix nitrogen, which comes from the surrounding rocks, but that’s enough for this tough little bugger to synthesize all the amino acids it needs to grow and thrive. It’s not the Andromeda Strain, though; oxygen will kill it—and it hasn’t seen oxygen for three million years, which give scientists (and even me) some idea of how old this strain must be.